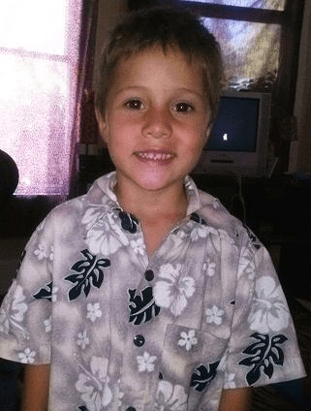 Shaun Tara, age 6, and his 3-year-old sister Delylah Tara, were murdered by their relative, Tami Joy Huntsman, and 17-year-old Gonzalo Curiel (a statutorily nonconsenting minor who lived with her). Huntsman and Curiel also tortured Shaun’s 9-year-old sister F.T. Huntsman’s 15-year-old son and 12-year-old twins also lived with them. At the time of his death, Shaun was enrolled in Monterey Charter Home School. F.T., Shaun, and Delylah were the children of Vivian Saucedo, who was killed in a car crash in December 2013. The children’s biological father, Shaun Daniel Tara, cared for them until he went to prison in early 2014. Then he sent them to stay with Huntsman, his cousin. In January 2015, Curiel (then age 16) moved in with Huntsman. Child protective services visited their home four times in 2015 due to reports of child neglect (called in by Huntsman’s 12-year-old daughter and various neighbors), but the investigators did not find any evidence of abuse. Shaun and Delylah were killed around late November or early December 2015, and Huntsman and Curiel concealed their bodies in a storage locker in Redding, California. The family then relocated to Quincy, CA, where the abuse came to light after neighbors noticed F.T. locked in a car outside their home and called the authorities. When F.T. was rescued she had “missing teeth, broken bones, and open sores” and she was immediately hospitalized. Investigators then determined Shaun and Delylah were missing and later discovered their bodies. Huntsman was charged with murder, torture, child abuse, and mayhem. Curiel was charged as an adult with the same crimes.